The hotel disposes of a total of 144 deluxe rooms, 4 of which are Junior Suites and 7 are Senior Suites. All of the rooms offer a spectacular view of the Mediterranean from their terrace and have recently been renovated. Now offering a private bath, air-conditionig and heating, satellite TV, direct dial telephone, minibar and in-room safe. 24 hours Room Service. Daily laundry service. First class hotels, designed to satisfy the most discerning guests. Luxury, highly personalized service and magnificent locations. Deluxe services in an inimitable setting. Find the perfect hotel for your next short break or vacation. 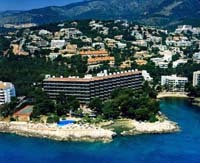 The Hotel has 361 rooms are at your disposition: 329 double rooms, 24 single rooms and 8 Junior Suites, many of them with views of the Bay of Palma and the Cathedral. All of the rooms offer a private bathroom with hair-dryer and magnifying mirror and amenities, individual air-conditioning, interactive satellite TV with remote control, Canal+, stock-exchange channel, videos, 2 direct dial telephone lines with fax and modem connection, Internet access, piped music, mini-bar, in-room safe and pillow menu. 3rd bed available. 24-hours Room Service. 171 rooms, including 6 Suites and 5 Junior Suites are at your disposition - the mayority offering fabulous views of the Bay. All of the rooms have a private bath with hair-dryer, air-conditioning/heating, direct dial telephone, satellite and interactive TV, videos on demand, hifi equipment (CD, radio, tape), piped music, mini-bar and in-room safe. Express laundry & ironing service. 24-hours Room Service. Distributed in four separate one and two-storied buildings surrounded by gardens, a total of 31 Suites/Junior Suites and 18 luxury rooms decorated in the typical Majorcan style are at your disposition. All the rooms are fitted with a full bathroom with hair-dryer and hydromassage, air-conditioning/heating, direct dial telephone, modem and fax connection, satellite TV, complementary in-room safe and minibar. The Suites/Junior Suites provide room for two to four people (3 adults maximum), living room with sofa-bed and all of the above mentioned features. "Scott's, a meticulously restored 18th century seigniorial townhouse, features 17 luxuriously decorated rooms and suites. Handmade oversized beds, goosedown pillows, and sumptuous breakfasts served until noon make Scotts “One of the most elegant and comfortable small hotels in the Mediterranean”. Recently selected as one of the world's 50 greatest hotels by New Yorker reviewer Diran Noubar, Scott's appeals not just to the royalty and famous folks who frequent the hotel, but also to anyone seeking unobtrusive luxury, unabashed comfort and warm service. The Island of Mallorca in the Balearic Islands, off the coast of Spain, in the Mediterranean sea, is the number one tourist destination in Europe. Scott's is located 15 minutes inland from the Island's capital in the Binissalem wine region, just 30 minutes from Mallorca's famous beaches." Port Adriano Marina Golf and Spa Hotel comprises three connected buildings like an amphitheater, with all rooms facing the sea. A hotel, rich in comforts, on which a magnificent sunset is guaranteed everyday. 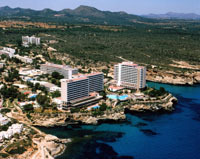 Situated betwwen Santa Ponsa and Poniente golf courses, it is only 28 km from the airport and 12 km from the city center. 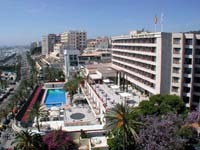 Sol Alcudia Center Hotel Aptos. 220 doubles rooms with living room, 47 studios for two people and 8 individual rooms. All with kitchen, refrigerator, microwave oven, bathroom, terrace, direct dial telephone, satellite TV and air conditioning. The hotel offers a total of 375 rooms, distributed on 9 floors. All of them dispose of private bath, balcony with ocean/mountain or pool-view, telephone, ceiling fan, heating, and safety deposit box (optional).